Accuweigh’s Newcastle branch recently commissioned three sets of hook lift truck scales for Newcastle City Council’s landfill operation. The hook lift truck scales alleviate the need for an onsite weighbridge to track the volume and weight of different types of rubbish being delivered to the landfill. Incoming waste material is sorted into nominated skip bins (solid waste, inert & general waste, concrete and green waste. When full, these skip bins are picked up by hook lift trucks fitted with scales which records and stores the weight of the waste materials and the barcode identification of the skip before they are emptied at the nominated landfill cell. 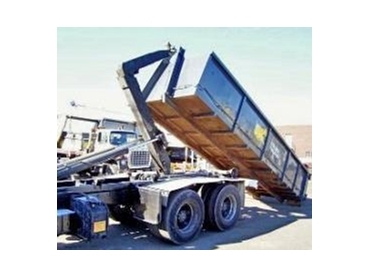 Specially designed heavy duty load cells are fitted on the truck chassis and a digital weight indicator is mounted in the cab to weigh the skip bin after it is pulled onto the truck. The hook lift truck scales are able to provide fast and accurate weight readings without the need for the truck to proceed to a weighbridge to obtain the weight of materials in each of the skip bins. At the end of the day, the stored data of the hook lift truck scales is downloaded into a spread sheet for waste volumes to be calculated on each product cell for EPA requirements. This allows N.C.C. to more accurately forecast the current capacity each cell, the soil cover requirements, the compaction ratio and also the residual air space of each cell. Accuweigh’s hook lift truck scales provides an economical means of collecting accurate data to assist the N.C.C. to better manage this landfill operation. Trade Approved hook lift truck scales are also available to suit a variety of truck layouts. Accuweigh is Australia’s largest industrial weighing company and has branches in all mainland states providing after sales service support on hook lift truck scales, payload monitoring systems and all onboard vehicle weighing systems.